A thriving trend in home design incorporates mid-century modern furniture and style throughout your home but don't forget about the kids' rooms! The new Dwell Studio Mid Century Collection offers this sleek, modern, and clean look for your little one's nursery or your children's rooms. Featuring a fresh French white finish, this collection is universal and is the perfect beginning to any room - simply decorate around it with your favorite colors to create your own design. This Dwell Studio Furniture offers a design focused look just for you! 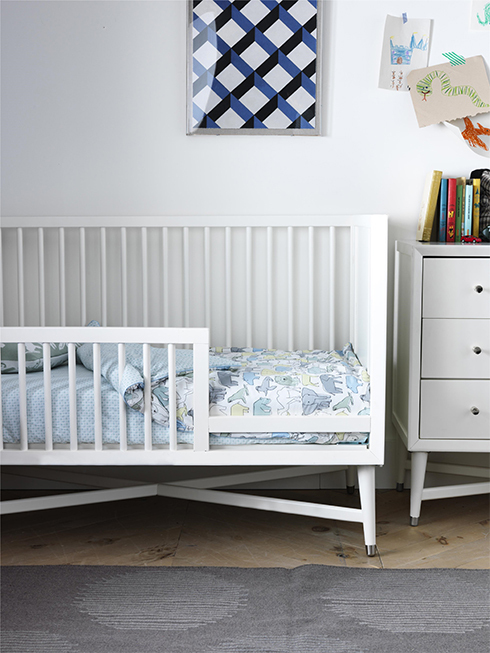 Between your bedding choices and wall color, the convertible crib is perfect for boys' or girls' nurseries. Tapered legs, steel feet, and a unique x-base design make this crib stand out from the rest. With three mattress positions available and a separate toddler rail available to purchase, this crib is perfect for bringing your child from baby to toddler and beyond! Pair the matching dresser and changing top for the perfect multifunctional piece. Store all of your necessities in the drawers and utilize the top for quick and easy diaper changes. Later, simply remove the changing top and continue to use the dresser as storage in your child's room. Choose from two bunk bed options within the collection! The Library Bunk Bed takes advantage of one of the bunk ends to provide ample storage including a mixture of open and closed storage cubbies. For sleepovers, opt for the Bunk Bed with Trundle. This bed offers three sleeping spaces! The sleek, clean design allows it to fit within most rooms too so it's an excellent choice for space constraints. Twin and full bed options are also available within the collection featuring the same clean design and beautiful tapered detailing. Take advantage of the storage with the nightstand at the bedside. With flaired legs, the nightstand truly reflects the mid-century design style. Study time isn't ignored with this collection either! The Kids Desk features built-in outlets for charging laptops, tablets, and plugging in desk lamps. There are a number of drawers to keep the study space clutter free and the matching desk chair is both comfortable and stylish. View this collection in person at Belfort's Dulles Kids Furniture Showroom or shop it online! With hundreds of room settings, Belfort is your ideal destination for style, design, and inspiration.